Holiday Cocktail Lounge in New York City’s East Village has a storied history as a dive bar magnet for artists and writers. 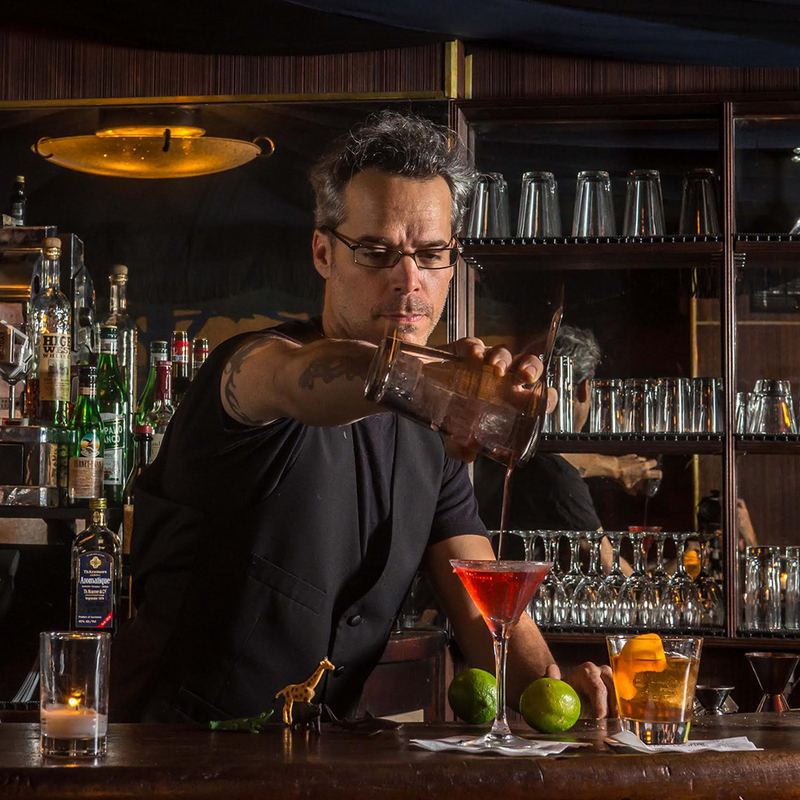 It opened in 1919 as a speakeasy and was last year resurrected as a more upscale but still unpretentious cocktail spot with Michael Neff as bar manager, formerly of Ward III and The Rum House. His goal has been to do good cocktails simply, with a bit of cheekiness and a focus on sticking to the bar’s roots by not being inaccessibly priced. The Long Island Iced Tea is made with tea purchased around the block at Porto Rico Importing Co.; a new piña colada variation has an Angostura float. Here, we got some background on his inspiration and favorite drinks. Pretty much as soon as I stepped behind one. In 1994, I was young, single and broke. A local newspaper ran an article about some bartenders in town, and I thought, "I stay up late anyway. I could do that." A friendly bartender of my acquaintance let me sit across his bar and showed me some of the basics. I memorized a bartending book, walked into a bar that I heard was hiring, and kind of talked my way in. I was immediately comfortable. Taking care of people in the way a bartender needs to was very natural to me. The rest of it was just learning how to become efficient, and I was lucky to have bartenders and managers around me who showed me the way. What's the inspiration behind the menu at Holiday Cocktail Lounge? Music is a big part of what we love about the Holiday Cocktail Lounge, and I take a lot of inspiration from songs that we play. A song provokes a feeling, or a particular spirit reminds me of a song, and then I build a recipe from there. Also, our garnish game has become a big part of what we do. While they might seem a bit esoteric at times, garnishing with a high-five or a literary quote is a way to engage people's brains and make them stop, think and interact. Engaging people in different ways makes them think differently about what they're actually putting in their mouths and has a big impact on their perception of how a cocktail tastes. In essence, we are garnishing with the world, which means we're garnishing with ourselves. What is your favorite cocktail that you have developed in your career, and why? That is a very difficult question for me, as I often make bespoke cocktails for individual guests. Because of this, I've "invented" thousands of cocktail, so it isn't easy to pick one that stands out as a favorite. One that does stand out as both delicious and evocative of the time and place in which it is meant to be consumed is the "Lost Hollywood," a cocktail that I made for a bar called Three Clubs in Hollywood. Rye whiskey, Fernet Branca, a dash of sugar, grapefruit oils and an Angostura Bitters infusion that I made specifically for the venue. It was meant to evoke Old Hollywood, with enough modern influences to make it relevant to our own time. It's an elegant little cocktail, and I've been proud to place it on other menus around the country. The Old Fashioned. It is perhaps the most simple cocktail to make in terms of ingredients, so its success relies solely on the quality of whiskey used and the technique of the bartender making it. There's nothing to hide behind when you're making an Old Fashioned; it reveals you as either a good bartender or not. What's an easy recipe that someone can re-create at home? This is an endlessly adaptable recipe that will work with most spirits. You can also adapt it by adding fresh fruit, herbs or anything else that you have handy. You can replace the simple syrup with alternative sweeteners like agave nectar. It's a gratifying base for experimentation, and will immediately make you very popular at all of your friends' houses and dinner parties.